Though it’s a small town, Santa Cruz is big on breakfast and for good reason: there are several great local spots to choose from. In this article, we take a look at the top places to grab some morning grub before embarking on a day of sunshine-filled adventure. You’ll notice that all of these tend to get crowded pretty early as they are popular and well-known among locals, as well as attracting plenty of out-of-towners during peak tourism months. 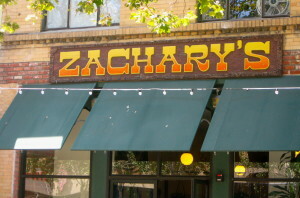 Zachary’s – It’s hard to think about getting breakfast in Santa Cruz without Zachary’s coming up. It’s located in the heart of downtown on Pacific Avenue and is one of the most popular spots for locals, students, and tourists alike. In spite of a rather large eating space, Zachary’s does get quite busy and it’s advisable to get there somewhat early if you want to avoid a wait. Local favorites from their menu include their delicious sourdough pancakes and of course, “Mike’s Mess,” their signature scramble plate. (It should be noted that Zachary’s is closed on Mondays). Walnut Avenue Cafe – Another great downtown breakfast spot, Walnut Ave. Cafe offers standard breakfast plates, fresh-squeezed juice, and an atmosphere that feels like a classic, old-time diner. Like Zachary’s, Walnut Ave. Cafe also gets crowded quickly so it’s best to try and get there early for a table, especially on the weekends. 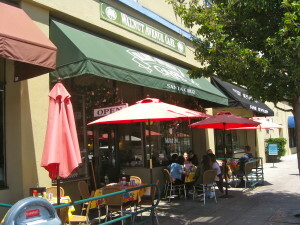 There is also limited outdoor seating, which is a pleasant and comfortable treat on most days in Santa Cruz. Cafe Brasil – Though it’s in a tiny building that was clearly once a home, Cafe Brasil is big on flavor and atmosphere. They offer a variety of Brazilian breakfast and lunch options, including their popular acai bowls, smoothies, and fresh squeezed juices. Parking is even more limited than seating at Cafe Brasil and it’s recommended that your park on a side street. Linda’s Seabreeze Cafe – A highly regarded and award-winning local cafe, Linda’s Seabreeze Cafe serves breakfast and lunch from their Seabright Ave. location. Another smaller eating spot, Linda’s tends to get crowded pretty early as you’ll note by the steady gathering of people outside the entrance. They serve classic breakfast dishes and offer sandwiches and burgers on the lunch menu. Linda’s is open from 6 a.m. to 2 p.m. daily and 7 a.m. to 1 p.m. on Sundays. Harbor Cafe – Just on the other side of the Santa Cruz Yacht Harbor from Linda’s is the Harbor Cafe. In business locally for more than 50 years, they serve standard breakfast plates as well as some great lunch options. Like the other places mentioned on this list, it gets crowded so getting there early is a good idea. Once you’re seated, you can relax outside with one of their delicious mimosas or bloody mary’s while you ponder your breakfast choice. This entry was posted in Blog-post by admin. Bookmark the permalink. What To Do In Santa Cruz? Follow Us To Find Out! Whether you are traveling and seek personal services during your stay, or you are a local in search of a spa or gym to meet your needs, you’ve found the spot. Santa Cruz has a wide variety of spas, gyms, and fitness centers for serious athletes, beginners, families, children, and anyone in between. Do you seek a brief respite from the daily routine? Do you need to make a change toward a healthier lifestyle? This collection of the best Santa Cruz health clubs and spas in the area will set you on your way. Thing To Do For Kids! If you have children, you know the importance of keeping them busy and entertained. This page was created with you in mind. Here is a collection of the best, family- friendly places in the Santa Cruz area. Which is the most child friendly beach, with restrooms close at hand? Where can you find a whale’s skeleton, or take a train ride along the beach? Do you know the best place to go berry picking, or where to find the coolest petting zoo? Which whale watching tour has the most patient staff? No matter the type of outing you seek, this collection of things to do in Santa Cruz for kids is sure to have just what you’re looking for.